The central result of classical game theory states that every finite normal form game has a Nash equilibrium, provided that players are allowed to use randomized (mixed) strategies. However, in practice, humans are known to be bad at generating random-like sequences, and true random bits may be unavailable. Even if the players have access to enough random bits for a single instance of the game their randomness might be insufficient if the game is played many times. In this work, we ask whether randomness is necessary for equilibria to exist in finitely repeated games. 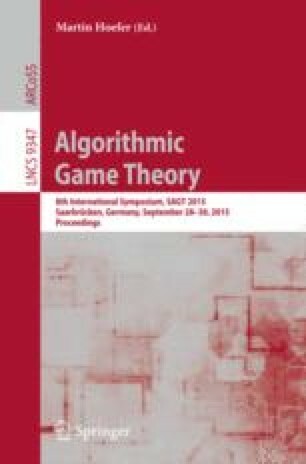 We show that for a large class of games containing arbitrary two-player zero-sum games, approximate Nash equilibria of the n-stage repeated version of the game exist if and only if both players have \(\varOmega (n)\) random bits. In contrast, we show that there exists a class of games for which no equilibrium exists in pure strategies, yet the n-stage repeated version of the game has an exact Nash equilibrium in which each player uses only a constant number of random bits. When the players are assumed to be computationally bounded, if cryptographic pseudorandom generators (or, equivalently, one-way functions) exist, then the players can base their strategies on “random-like” sequences derived from only a small number of truly random bits. We show that, in contrast, in repeated two-player zero-sum games, if pseudorandom generators do not exist, then \(\varOmega (n)\) random bits remain necessary for equilibria to exist. P. Hubáček—Supported by the I-CORE Program of the Planning and Budgeting Committee and The Israel Science Foundation (grant No. 4/11). M. Naor—Incumbent of the Judith Kleeman Professorial Chair. Research supported in part by grants from the Israel Science Foundation, BSF and Israeli Ministry of Science and Technology and from the I-CORE Program of the Planning and Budgeting Committee and the Israel Science Foundation (grant No. 4/11). J. Ullman—Supported by a Junior Fellowship from the Simons Society of Fellows. Part of this work was done while the author was at postdoctoral fellow at the Center for Research on Computation and Society at Harvard University.